Updates | 2012 Central Washington Fire Recovery | Recovery after large wildfires begins before the fires are completely contained. The National Weather Service has posted a FLOOD WATCH till 9 p.m. this evening. Thunderstorms are developing over the mountains of Chelan and Okanogan counties; many of these storms will be slow moving or stationary. Persistent thunderstorms over or near wildfire burn scars and steep sparsely vegetated slopes could produce flash floods and debris flows this afternoon and evening. Rainfall may lead to flash flooding or debris flows, both of which can be very dangerous. Persons in the flood watch area should be alert to changing weather conditions and monitor NOAA weather radio or other weather information sources. Be prepared to leave the area on short notice if heavy rainfall occurs. A detailed view of the hazard area is online [HERE]. Check our FLOOD WATCH section for detailed information on flash flood preparedness. The National Weather Service’s Spokane office has issued a hazardous weather outlook and red flag warning for much of central and eastern Washington. Showers and thunderstorms are expected to increase Thursday afternoon and evening, with brief heavy rain and hail. Stronger storms are possible with larger hail and gusty winds closer to the Blue Mountains. From late evening the storms will change to rain showers and more isolated thunderstorms across north-central and eastern Washington and into northern Idaho. Rain showers with occasional thunderstorms are expected for Friday, lingering into Saturday. Locally heavy rain is possible across north-central and northeast Washington and into the Idaho panhandle. Check our FLOOD WATCH section for detailed information on flash flood preparedness. Tired of the rain? Watch out for flooding! Local areas below or downstream of last year’s wildfires are at risk of flooding, mudslides, and debris flows — and area officials are closely watching rainfall levels and intensity. The soils in burned areas are not nearly so absorbent as normal, and the previous vegetation that held soil in place hasn’t completely recovered from the 2012 wildfires. When heavy rains occur in burned areas, the ash-laden runoff can cause objects that don’t normally float to do just that, and they can come ripping downstream to areas below the fire scars. Agency officials and weather experts met yesterday to discuss the threats posed by forecasted rainstorms in the upcoming weeks. Risks of flash floods and debris flows will likely continue for the next three years, according to Greg Kuyumjian, the forest hydrologist on the Okanogan-Wenatchee National Forest who manages the agency’s Soil, Water & Air program. He says a tenth of an inch of rain in ten minutes is the “trigger point” for serious problems with flooding and debris flows. “A hard rain or downpour for ten minutes will initiate rapid collection and monitoring of rainfall amounts,” says Kuyumjian. “The rain intensity is enough that if you’re driving, your wipers can’t keep up and you should pull over. That’s the kind of hard rain to be alert for.” He adds that the terrain in central Washington means there is always a risk of flash flooding with sustained heavy rainfall, but the fires of last summer and fall exacerbate the risk. The U.S. Geological Survey (USGS) has installed rain gauges to provide an early alert system near areas burned in the 2012 fires. Chelan County Public Works Department cooperated with the county’s Natural Resource Department, the U.S. Forest Service, the USGS, Natural Resource Conservation Service (NRCS) and Cascadia Conservation District to purchase and install these gauges; the locations selected were based on historic flooding, high burn severity areas, and population centers. There are maps of the gauge locations [HERE] and [HERE], and the Chelan County Public Works page has more info on the gauges. Hendershot recommends that residents be prepared, monitor the USGS rain gauges, and have a plan to move to higher ground in case of heavy rainfall. Items kept outside should be moved to indoor locations or secured in advance of heavy rains — boulders, trees, lawn furniture and even cars are often swept up and catapulted downstream in a heavy debris flow. In 1981 at Tanque Verde Falls near Tucson, Arizona, a flash flood resulted from a small but intense thundershower that produced extremely rapid and concentrated runoff, and an 8-foot-high wall of water ripped down the Tanque Verde Wash through an area where over 100 people were picnicking and swimming. Because of the steep canyon walls and the sudden appearance of the flash flood, people were caught completely unaware. Eight people were swept down the wash; five went over the falls and were killed on the rocks and three others drowned. About 20 more were stranded in life-threatening positions requiring emergency rescue. 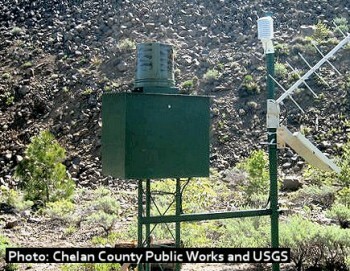 To monitor post-fire areas for flash flood risk, the USGS and Chelan County Public Works have installed ten rain gauges in Wenatchee Valley areas. The gauges function as an early-alert system, transmitting data by radar to the National Weather Service (NWS). Information from the gauges is monitored by the NWS for rainfall levels that would prompt an advisory or flash flood warning. 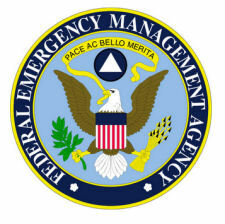 Check our FLOOD WATCH page for detailed information on flood preparedness. Several inches of rain from western Washington south through Oregon through Tuesday could result in localized flooding. 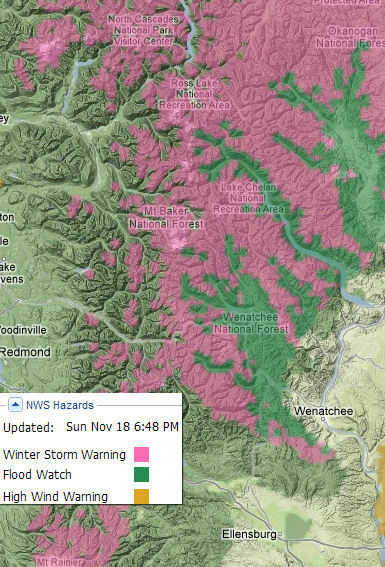 Heavy snow in the Cascades will create hazardous winter weather conditions in the mountains. Strong winds with gusts over 60 mph are expected tonight and into Tuesday. 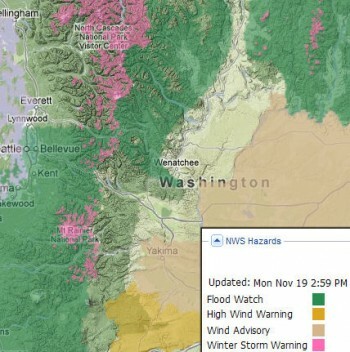 Central Washington residents should be alert for high winds that may drop branches and trees onto roadways or into streams, which could cause blockages that result in localized flooding. Keep drainages and waterways around your property clear of debris whenever possible, and call your local emergency services if you see blocked areas that are diverting water or causing backup of streams. The strong storm that’s hitting the Pacific Northwest is producing hurricane-force wind gusts, many of which have slammed the Northwest coast. Naselle Ridge, Washington recorded gusts of 114 mph, and other notable reports included gusts of 101 mph at Megler, Washington, 98 mph at Yaquina Head, Oregon, and 74 mph at Astoria, Oregon. Streams and urban areas are at risk of flooding, and residents should be alert for mudslides and road washouts. Wildfire burned areas will be especially vulnerable to flooding and mudslides. The National Weather Service today issued a flood watch for sustained heavy rainfall in the lower elevations of north-central Washington. 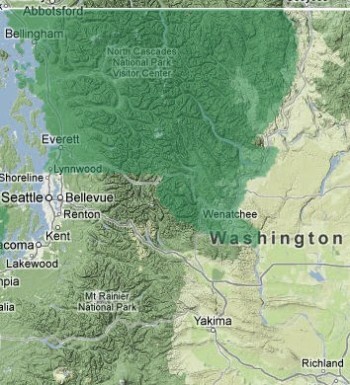 The flood watch includes Chelan and Okanogan counties, including the Chelan area, Leavenworth, and Plain. The flood watch is in effect from late tonight through late Monday night. Snow levels should remain high and most of the expected precipitation will fal as rain below 3,500 feet. Predicted rainfall amounts could range from one to three inches. Large mainstem rivers are not expected to flood, but smaller streams and urban areas may experience flooding. Residents can expect mudslides and road washouts. Area residents near wildfire burned areas will be especially vulnerable to flooding and mudslides. A wildfire emergency doesn’t end when the smoke has cleared. NOW is the time to prepare for post-fire flooding. Check our Flood Watch page and our Links page for current and predicted weather conditions. 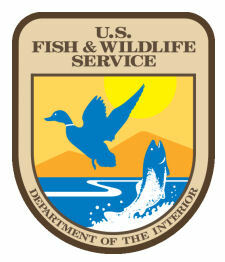 The Washington State Department of Ecology also has River & Stream Flow Monitoring information online. Small craft advisories and gale watches have been issued for coastal areas of Washington and Oregon, and the first in a series of storm systems will affect the Pacific Coast in the next few days. Heavy rain and mountain snow are expected with this system, along with strong winds along the coast. Moderate rain should develop along the Pacific Northwest and Western coasts by Saturday evening. Chances of rain in the area will increase to 80 percent by Sunday and 70 percent by Monday and Monday night. Floods are the most common and costly natural hazard in the U.S., and the results of flooding can be devastating. While some floods develop over time, flash floods, particularly common after wildfires, can occur within minutes after the onset of a rainstorm. Even areas that are not traditionally flood prone are at risk after wildfires. Remember, the fire emergency doesn’t end when the smoke clears. NOW is the time to prepare for post-fire flooding. 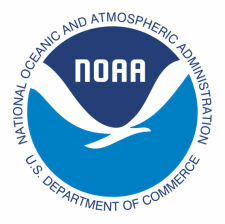 Check our Flood Watch page and our Updates page for current and predicted weather conditions. 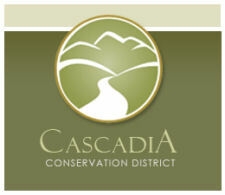 The Washington State Department of Ecology also has River & Stream Flow Monitoring information online. On our RESOURCES page is a collection of information and recommendations for landowners in the central Washington area who were affected by the 2012 wildfires. 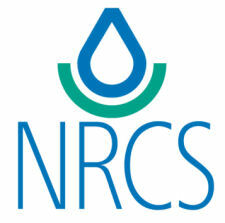 Also online are numerous resources provided by the NRCS for private landowners whose properties were affected by the fires. The National Weather Service continued a flood watch this morning with a forecast of more rain today, tonight, and tomorrow over the Cascades. Rivers and streams in the Wenatchee, Methow, and Entiat basins are rising. 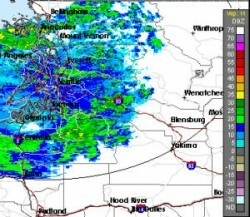 The NWS estimates that another inch or more of rain will fall along the Cascade crest, but rains should end by Thursday evening. Additional rain over the Wenatchee burn areas is predicted at a tenth to a quarter of an inch. The flood watch remains in effect through late tonight for Chelan, Douglas, and Okanogan counties. Today through Thursday, more rain is predicted and mountain runoff will feed small streams in the Wenatchee, Entiat, Stehekin, and Methow basins. Gages near the burn areas have measured between an inch and an inch and a half over the last four days. The NWS forecasts that streams will likely continue rising through Thursday. Residents should monitor forecasts and be alert for possible flood warnings. Be prepared to take action if flooding develops in your area. The National Weather Service has issued a flood watch for heavy rainfall through midweek along and near the east slopes of the Cascades. The flood watch is in effect through late Wednesday night for Wenatchee, Leavenworth, Cashmere, Entiat, Chelan, Manson, Plain, East Wenatchee, Mazama, Winthrop, Methow, Twisp, and Conconully. Rainfall of 2 inches or more is expected along the Cascade crest near Stevens Pass, Washington Pass, and Stehekin between Tuesday morning and Wednesday night. The burned areas near Wenatchee could receive an additioinal half inch or inch of rain. 10/30 radar image – National Weather Service – click for current loop. Heavy rains in the burned areas will increase potential for mudslides and debris flows, and small creeks and streams will rise markedly and could produce flooding. The Stehekin and other rivers have already risen sharply, and the White River and Nason Creek are of particular concern for flooding. Residents should monitor forecasts and be alert for flood warnings. Be prepared to take action if flooding occurs in your area. 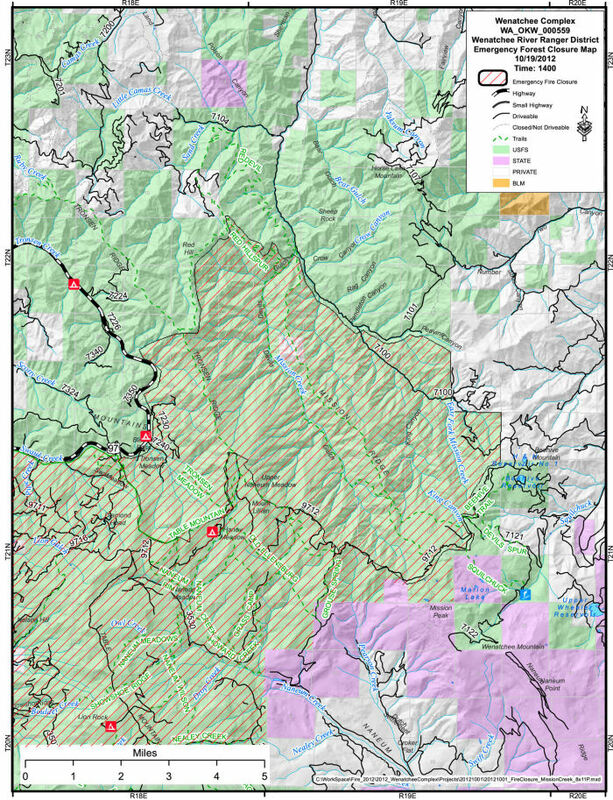 Several forest closures are in effect because of post-fire hazard abatement work, including removal of hazard trees, road culvert work, waterbar construction, and other projects to reduce risk in the fire areas. Check with your local Ranger District office for current status on area closures – some of these closure areas may change in size. Some of the closed areas may be re-opened, but others could remain in place till spring. Closures will probably remain in effect through the winter around the Mt. Cashmere Fire, Basalt Fire, and Peavine Fire in the Mission Creek drainage. 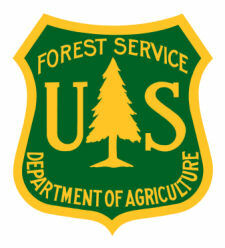 Forest Service personnel hope to open some winter recreation areas near Tronsen Meadows and the Liberty Beehive Road if weather conditions allow completion of hazard tree removal. Weather conditions will determine whether this work can be accomplished before snow covers the area. The Table Mountain Fire area closure has been reduced to the perimeter of the burned area, and the closure will remain in effect until the first week of December or until snow accumulation is adequate to allow limited grooming to occur. 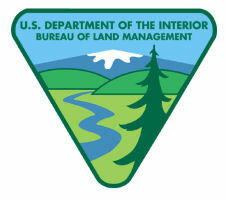 Contact the Cle Elum Ranger District at (509)852-1100 for up-to-date information. Click any of the maps below for a larger version. 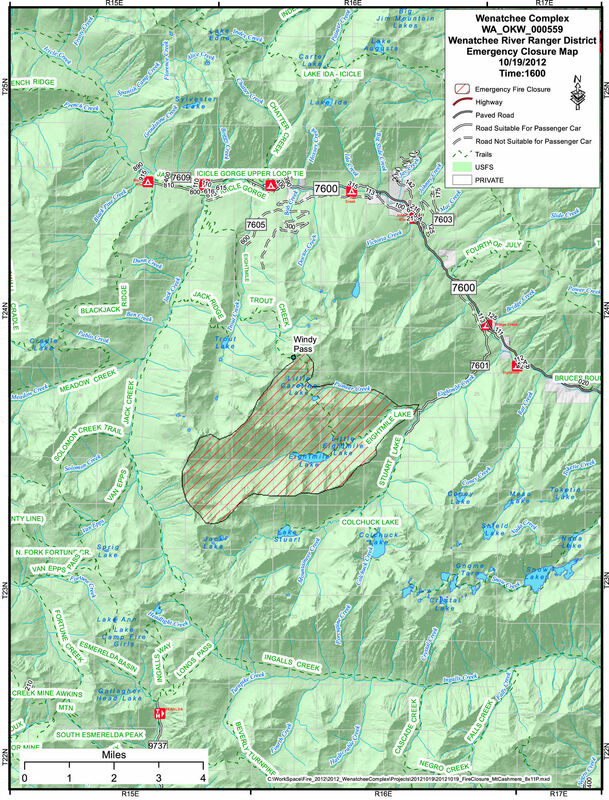 The Eightmile Lake area south of Windy Pass and north of Colchuck Lake on the Wenatchee River Ranger District is closed. The Basalt Peak Area northeast of the Rock Creek Guard Station and south of Basalt Pass on the Wenatchee River Ranger District is closed. The Table Mountain area south of Poison Canyon and northwest of Wenatchee Mountain, east and south of Hwy. 97, on the Wenatchee River Ranger District is closed. Residents along creeks and rivers in Kittitas and Yakima counties should be aware of rising water resulting from predicted heavy rain along the east slopes of the Cascades this week. The National Weather Service forecasts up to three inches of rain for the mountains through Tuesday night. Residents should be alert for rapidly changing conditions. The threat of flash flooding near Mission Creek, No. 1 and No. 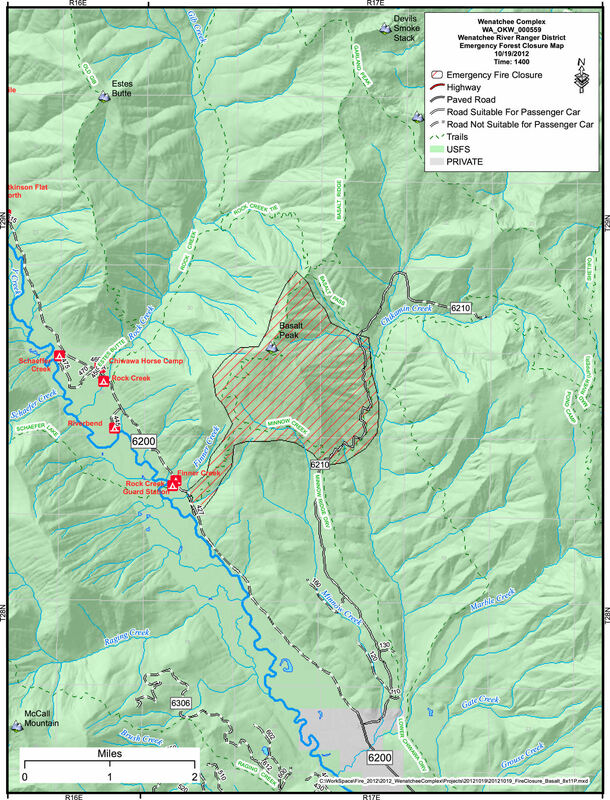 2 Canyons above Wenatchee, Highway 97 below the Byrd Canyon Fire, Crum Canyon up the Entiat River, and First Creek above Lake Chelan State Park is extremely high because of steep terrain in the burned area. 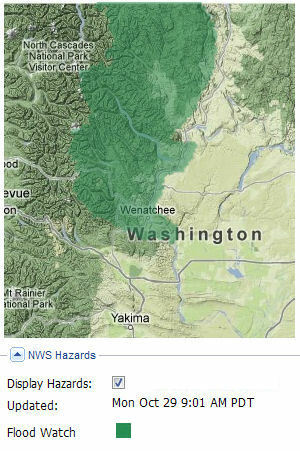 The Wenatchee World reported that a flash-flood advisory is posted for all of Chelan and Douglas counties and western Douglas County because of the predicted storm that could produce as much as 3 inches of rain in lower elevations and 6 inches in the Cascades. The advisory will be in effect from Monday evening through Wednesday evening and covers the eastern slopes of the Cascades. The NWS said that 1 to 3 inches of rain will inundate already saturated soils and could cause flooding, mudslides, and debris flows on and near areas burned by wildfire. Streams and creeks will see quick rises as early as tonight, and the White River and Nason Creek near Plain are of particular concern. Check the NWS Spokane Forecast page for the most up-to-date weather information, and check our Flood Watch page for information on preparing for flooding. WHO SHOULD ATTEND: Entiat and Chelan area homeowners and property owners who live within or adjacent to the burn area and might be affected by runoff. This will be the only meeting in the immediate area this fall to address these issues. The agencies who can help and advise homeowners and property owners will all be present to answer questions and provide assistance and resources. Speakers will include representatives from cities, Chelan County, USFS, NRCS, DFW, DNR and more. 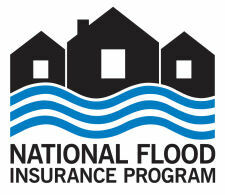 Information about national Flood Insurance will also be available. We are adding to this page as new information and resources are identified. Please bookmark and keep checking this site for new postings, both before and after the workshop. 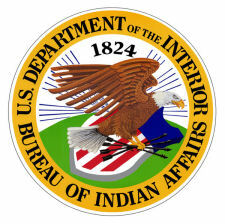 On the new web page, you will find more information about the fires and links to websites, brochures and forms that you will need to better cope with what has happened and the after-fire impacts that you should be aware of, along with contact information for agency personnel and others who can assist you.